Construction Application for Payment Solution works with QuickBooks to help you automate the time-consuming and error prone process of manually creating AIA G-702 and G-703 billings by using data that you have already entered into your QuickBooks company file. It takes hours each month to complete these billings by hand, through the use of an Excel spreadsheet, or with a stand-alone program; where you must constantly update the information. 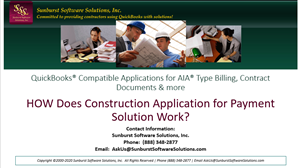 Click on the 1st image in the Demonstration column to watch a 10-minute Audio/Video which will provide you with a general overview of how Construction Application for Payment Solution works with your QuickBooks data to produce AIA billings. Click on the image in the Sample G-702 Payment Application column, to view a full-sized sample .pdf report. Click on the imaage in the Sample G-703 Continuation Sheets column, to view a full-sized sample .pdf report. Free, fully functional, 30-day trials available upon request. Comprehensive self-paced training is available free of charge, from the folder Construction Application for Payment Solution Training, Support, & Resource Center , once there - look for the Construction Application for Payment Solution Audio/Video Training category. "All sample forms shown below are printed using plain 8 1/2" x ll" paper." *NOTE: Most of the links on this page are still broken -ONLY the the items in the first row will work.